Expecting critical and enhanced fire weather to continue through the beginning of next week. Dry, warm air continues to be entrained from the desert southwest (see the water vapor imagery below) and stronger winds aloft are mixing down to the surface. With relative humidity values in the teens to single digits across the state, conditions are ripe for rapid expansion of fires. Starting Saturday, low-level moisture begins to return to the lower-elevations as the persistent trough to our west begins to move eastward. This should decrease the fire danger some though it take a while for the trough to move east of the area. As the trough moves east, the 500mb flow gradually changes from southwest to more westerly. This will entrain some higher Precipitable Water (PW) values, so by Sunday the critical fire weather should downgrade to enhanced fire weather or no threat. Also expecting to see showers and thunderstorms to start to return to the forecast from Sunday into Monday as the 500mb high moves into the Texas Panhandle. West of the Continental Divide, showers and weak thunderstorms will be most likely over the San Juan Mountains and near the Divide. Over eastern Colorado, storm coverage from Sunday into Monday is expected to increase over the eastern high terrains. Not expecting much rain from these storms due to lack of low-level moisture and decent steering winds. With adequate temperature/dew point spreads, some gusty outflow winds will be possible. Early Tuesday morning, the GFS is showing a weak cold front moving through the northeast corner of the state. Questionable as to how much moisture will return behind the front, but Tuesday’s temperatures will likely be a bit cooler over this area. Overall, should see an increase in afternoon thunderstorm coverage over northeastern Colorado from Monday into Tuesday. Wednesday, downsloping flow will pick back up, so a downtick in thunderstorm activity is expected as drier air becomes entrained into the low and mid-levels of the atmopshere. Currently, the GFS shows a stronger cold front dropping through the state on Thursday, which if this occurs, will give us our first taste of fall after a long, unseasonable warm stretch of weather. At this time, there is No Apparent Threat for flooding during this FTO period. Starting on Saturday night, PW plumes start to show a return to more seasonal moisture values from west to east. This should first cause an increase in cloud cover on Saturday, and then an increase in storm coverage over the higher terrains on Sunday into Tuesday. Low-level moisture doesn’t last long over western Colorado, with a return to below average PW values after Monday. Enhanced/Critical fire danger will likely return to the forecast over this area should PW values drop below 0.4 inches as surface winds are currently forecast to be in the 15-20 mph range. Over eastern CO, there are elevated PW values from Sunday through Tuesday. Quite a bit of spread after this, which likely has to do with how much moisture returns behind the front. Tune back into the FTO on Monday to see how the members are trending for the end of next week. If PW values are able to stay above about 0.5 inches, we will likely still see some scattered storms over the mountains in the afternoon and evening hours on Wednesday and Thursday. If the cold front does drop through on Thursday, snow may be possible over the highest elevations. No Apparent Threat as moisture returns with eastward movement of the ridge for scattered afternoon showers and thunderstorms. Expecting low-level moisture to increase from the southwest to northeast on Saturday into Tuesday. At first this should only increase cloud cover, but by Sunday and Monday there should also be an increase in shower and weak thunderstorm coverage over the higher terrains. Early Tuesday morning, a cold front may move into the Northeast Plains, which could cause an increase in storm activity over this area during the afternoon. The low-level moisture is short-lived as downsloping winds begin to mix dry air back into the low- and mid-levels of the atmosphere on Wednesday. Expecting enough residual moisture under the ridge for some isolated, high-terrain showers on Wednesday. At this time, unsure about a cold front moving through on Thursday as there is quite a bit of disagreement between GFS members. Should this occur, showers and thunderstorms may be possible (with snow in the highest terrains) over the mountains and adjacent plains on Thursday evening. Please tune back into the FTO on Monday, and for now, we will leave this out of the rainfall map below. We’ve been monitoring the reservoir storage since the beginning of May since it was such a low snowpack season for the majority of the state. With a weak 2018 monsoon season over western Colorado as well, the southwest corner of the state is currently experiencing exceptional drought conditions with the majority of western Colorado (and the Southeast Mountains) undergoing extreme drought conditions. 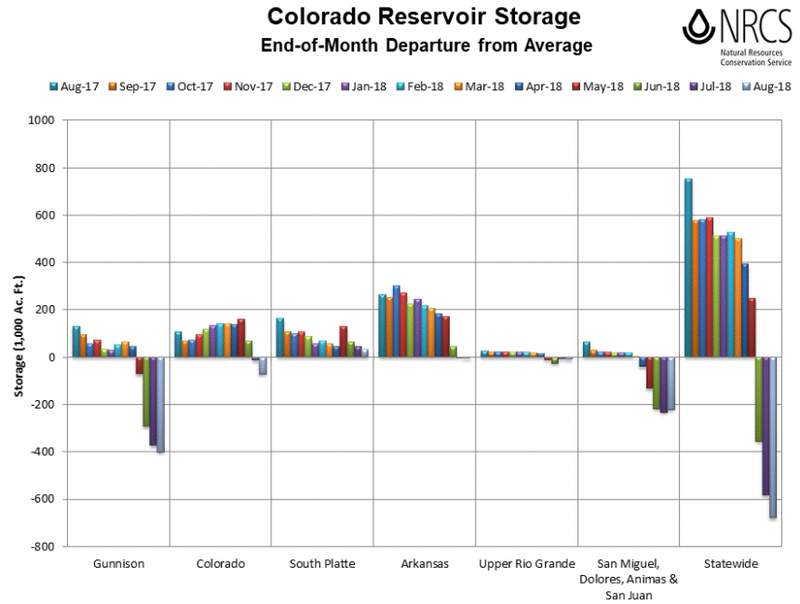 Below is the end-of-month departure from average (Aug 2017-Aug 2018) as well as a monthly reservoir storage summary for August. Compared to this time last year, statewide reservoir storage is 38% lower. Currently, statewide reservoir storage average is at 82%, which is about 700,000 acre feet below normal. 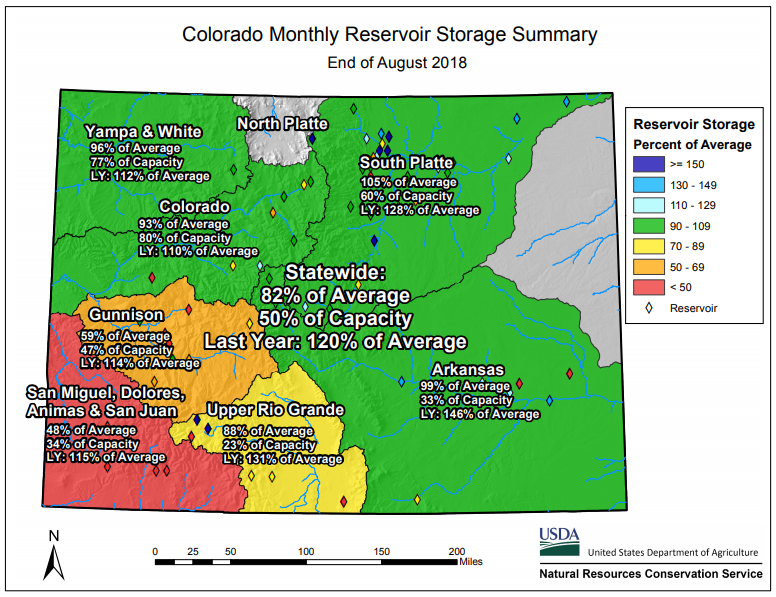 The Blue Mesa Reservoir (Gunnison River Basin) has been in the news lately as it is at 37% of normal capacity. This is the lowest water level seen since 1987. 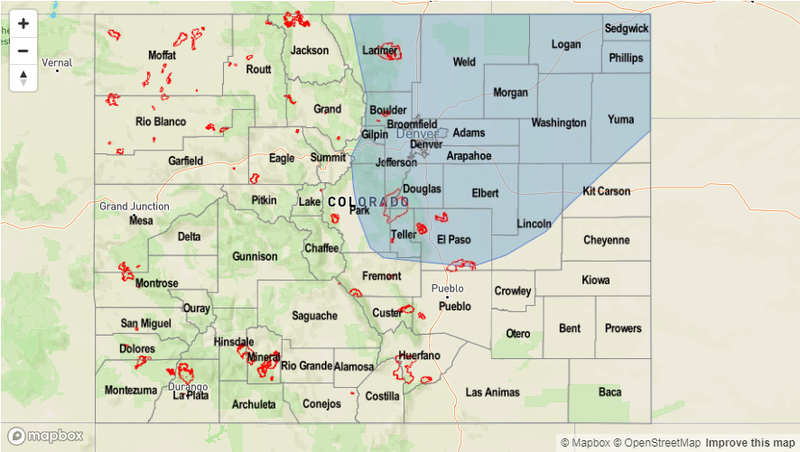 Overall, still seeing below normal storage in the Gunnison and San Miguel/Dolores/Animas/San Juan basins. While there has been slight improvement in the latter basin, it is still about 50% of average. 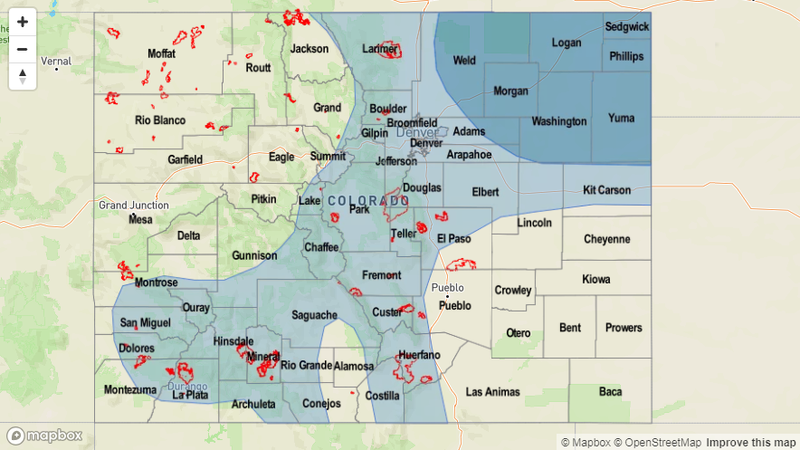 The Colorado and Upper Rio Grande basins are also slightly negative, which is contributing to the statewide deficit. The above average temperatures seen so far in September and warm forecast this week will likely continue to chip away at the storage. The forecast from Thursday’s FTO is still on track. Westerly upper-level flow begins today and will continue through tomorrow under a weak ridging pattern. This will continue to push the higher moisture to the east, though some residual moisture could produce some patchy showers over the higher terrains on Tuesday (Event #1). A shortwave will move through the state as well, which may help produce widespread, afternoon cloud cover over the high terrains. 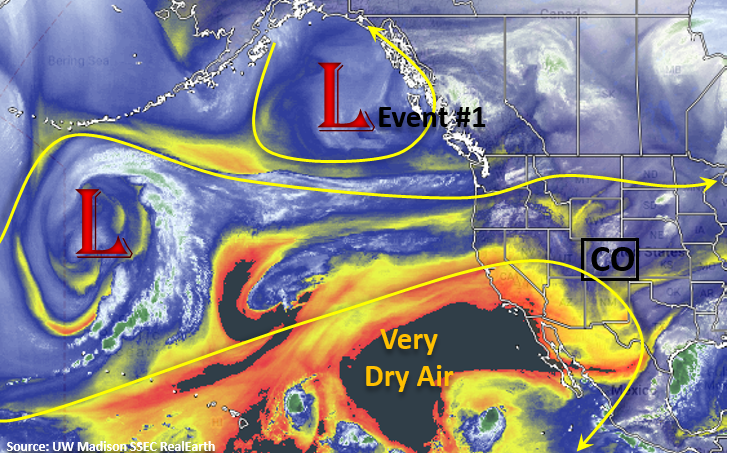 By Wednesday, upper-level flow will turn southwesterly as a positively tilted trough builds over the west coast. This will continue to entrain a very dry air mass from the southwest (AZ/NM) seen in the water vapor imagery below. So by Wednesday, southwesterly flow should mix out all the residual moisture under the ridge, so not expecting any measureable rainfall. Instead, forecasting plentiful sunshine and warmer temperatures through the start of this weekend. By Wednesday, an upper-level jet oriented southwest to northeast will move into the northwest corner and west-central portion of the state. With warmer temperatures and low relative humidity in place, stronger surface winds will likely produce some critical fire weather over the state focused over this region. Strong winds may also mix down to the surface over the eastern plains during this period, which could cause some fire weather issues here as well. Please tune back into the FTB on Wednesday and Thursday for more details as a Red Flag Warning will likely be necessary. The GFS is still showing the west coast trough moving through the state at the end of next weekend (Event #2), so their will likely be some moisture return with the shortwave and an uptick in afternoon thunderstorm activity. At this time there is No Apparent Threat for flooding during this FTO. The diurnal low-level moisture cycle shows high enough values on Tuesday for some possible showers and weak thunderstorms over the high terrains. They will likely be focused over the southern Front Range and Southeast Mountains, though a storm or two could form over the San Juan Mountains. Over the adjacent plains, a couple storms may survive and produce some light rainfall over the Palmer Ridge and Northeast Plains. After Wednesday, PW values drop off quite a bit statewide. This should give us a break from rainfall until the trough moves through at the end of next weekend. While moisture return looks weak over western Colorado this weekend, there is an upward trend in PW values over eastern Colorado. While it will likely not reach 1 inch (and cause flooding issues), above average seasonal PW values will likely cause an uptick in storm activity over the higher terrains. Steering winds are forecast to be quick enough that burn scar flash flooding should be avoided (at this time). Please tune back into Thursday’s FTO as models will likely come into better agreement with timing of the trough passage and magnitude/timing of the moisture return. Below we describe the two identified precipitation event of this FTO in more detail. No Apparent Threat as residual moisture under the ridge produces one more day of isolated showers and weak thunderstorms over the mountains and Northeast Plains. Storm activity should be similar or less than this afternoon as dry air continues to be entrained over the state. None the less, some isolated showers are possible over the higher terrains with residual moisture under the ridge. The passage of an afternoon shortwave will also help to increase cloud cover over the mountains and adjacent plains tomorrow afternoon. Max 1-hour rain rates should stay below flood threat criteria for recent burn areas with higher rainfall totals north of the burn scars. With temperatures near 90F at the lower elevations and low dew point values, rainfall over the I-25 corridor is not likely. If the storms are able to stay together as they move into the Northeast Plains and eastern Palmer Ridge regions (help from the shortwave), dew points in the high 40Fs may help produce some light rain. No Apparent Threat as a second trough moves eastward from a nearly stationary position this week and brings a boost to low-level moisture. A little better confidence that a couple shortwaves will move through northern Colorado during this period. A boost to low-level moisture will also be likely though values should stay under 1 inch. Not much low-level moisture return for western Colorado, so there is a better chance for rainfall over the Front Range, Southeast Mountains, Palmer Ridge and Northeast Plains. Still quite a bit of uncertainty as to how much moisture will return for storm coverage and intensity, so at this time we’ll just say there should be an uptick in afternoon shower and thunderstorm activity. Please tune back to Thursday’s FTO for more information and changes to this forecast. Before starting the FTO, we’re going to take a quick look at August precipitation and temperature compared to normal across the state. The image below shows the Northwest Slope and Southeast Plains receiving quite a bit of rainfall. 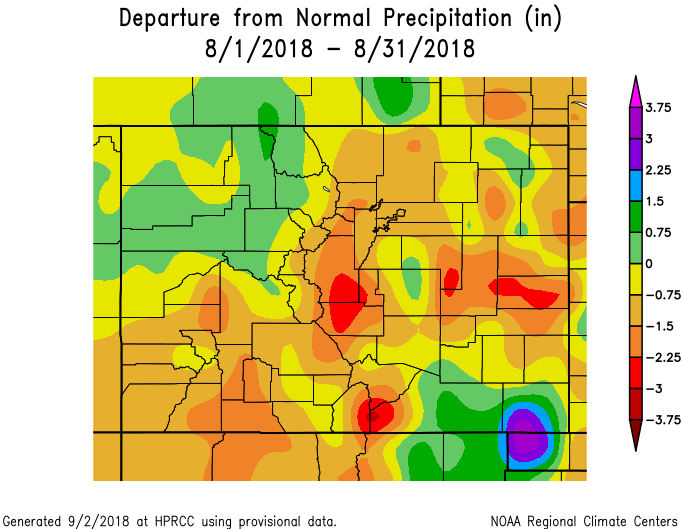 The more than average Northwest Slope rainfall was likely due to multiple systems clipping the northern border, while the above average precipitation over Baca and Las Animas was due to a couple systems that dropped heavy rainfall. Temperatures for August (not shown) were below average over eastern Colorado, which makes a lot of sense due to the active weather pattern and lots of mornings with a stratus deck. Western Colorado was above average with the Grand Valley, Southwest Slope and western Central Mountains 3-4F above normal. The second image below shows the departure from normal precipitation from June 1st – August 31st, which covers the main portion of the monsoon season. Despite above average precipitation over the Northwest Slope in August, overall precipitation is 1 to 3 inches below normal for the season. That’s likely due to not too many monsoon moisture surges making it that far north. 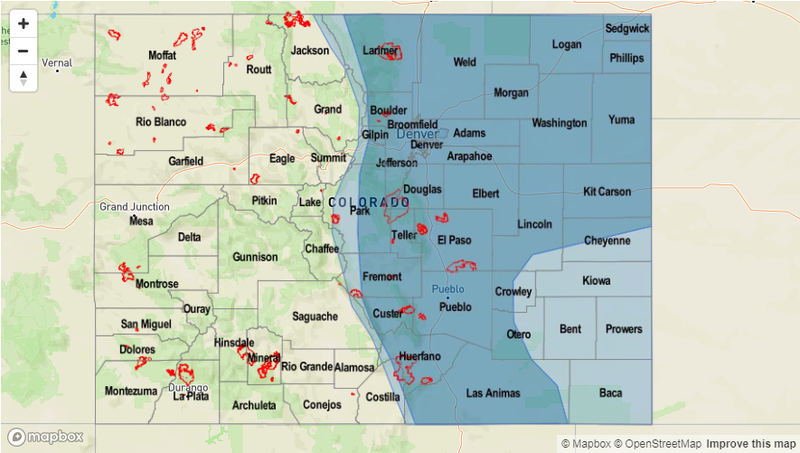 Generally, and discussed before, it was a slow monsoon season for western Colorado. There were only a couple classic monsoon setups, which is why precipitation is about 3 to 4 inches below normal in these areas. 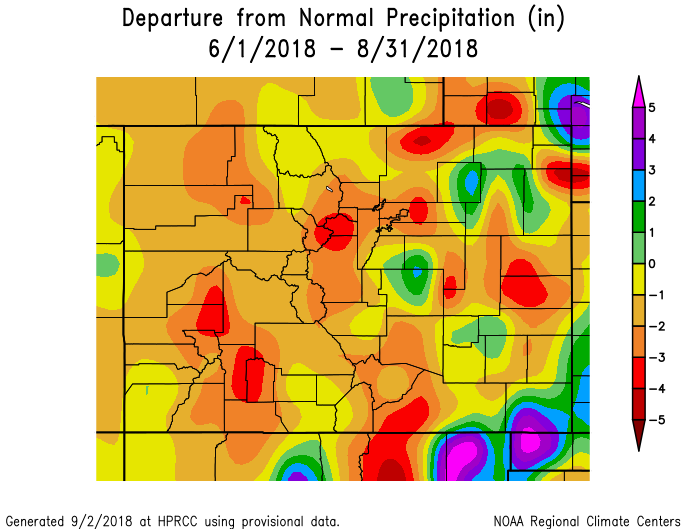 Over eastern Colorado, Gulf of Mexico moisture was present more from June through August (comparatively), thus there are some pockets of above normal precipitation for the season. Overall, the Southeast Mountains and Front Range (along with all mountain areas) were quite dry, which helped support an active fire season. 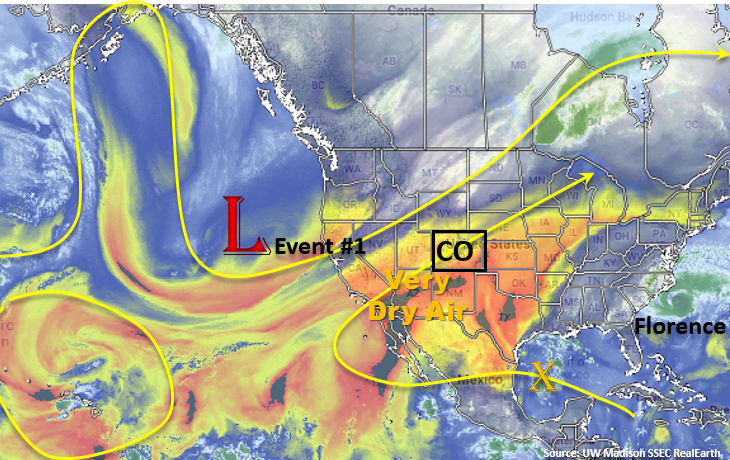 The broad upper-level trough mentioned in Monday’s FTO continues to influence the weather over Colorado and is marked in the water vapor imagery below. The extremely dry air has started to make its way into AZ and Mexico, which will come into play next week. Overall, still experiencing some weak steering winds, which paired with high low-level moisture of the state has caused a couple of days of heavy rainfall. 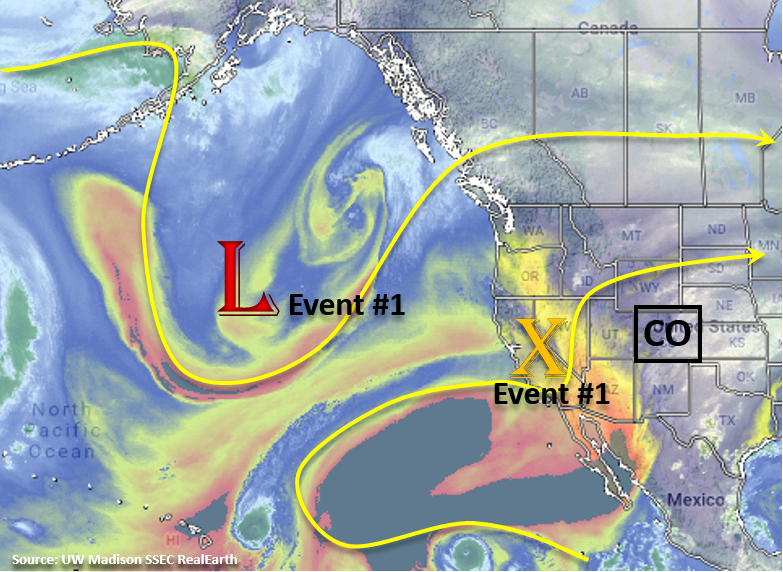 For Friday into Saturday (Event #1), the upper-level trough begins to move east and the Colorado light northwesterly flow aloft becomes much stronger. This, paired with a bit more dry air, will keep flood chances low this weekend. On Saturday into Sunday, some residual moisture under the ridge will likely spark some overnight showers associated with the passing trough in the mountains and then another round of afternoon thunderstorms over the higher terrains. Westerly flow takes over on Monday as a weak ridge/zonal pattern begins to build over the state. Expecting some cooler temperatures to start the work week as cold front passes through the state behind the trough. Downsloping winds aloft will promote drying through the start of next week and start to push the higher moisture east. 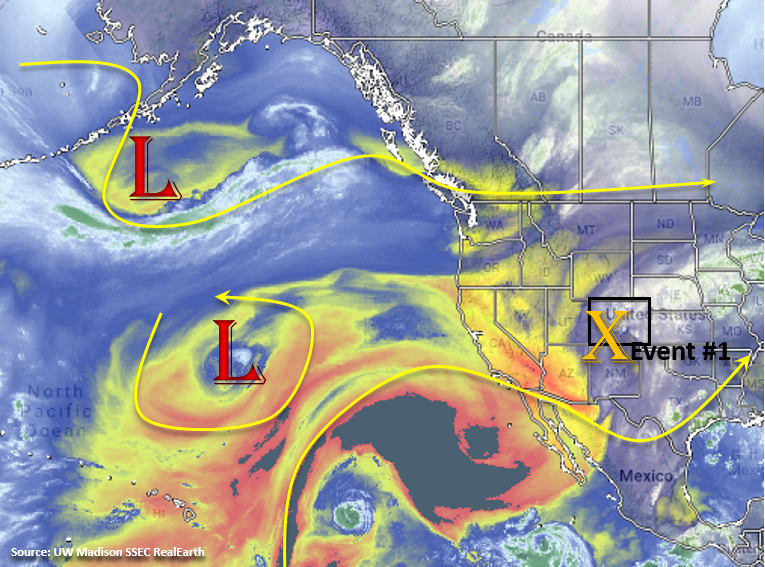 Mid-week, upper-level flow will turn southwesterly as a positively tilted trough builds over the west coast and Pacific Northwest. This will continue to entrain a dry air mass from the southwest (AZ/NM), so next week should be fairly quiet as far as rainfall. Fire danger will likely increase with higher temperatures and low relative humidity as well. Some stronger surfaces winds over the northwest corner of the state on Wednesday and Thursday could cause critical fire weather. 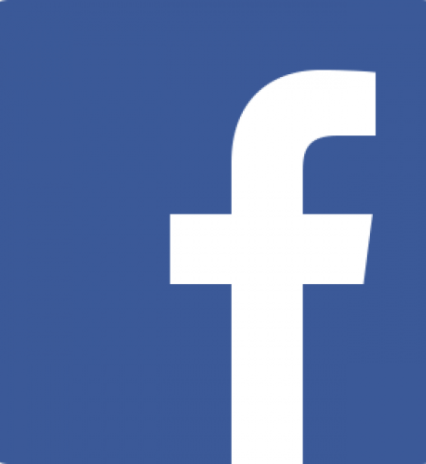 Please tune back into the FTO on Monday for more details. The GFS is still showing the west coast trough moving through the state next weekend (Event #2), but at this time there is low confidence in this solution as well as with availability of low-level moisture for heavy rainfall. Low-level moisture drops off quite a bit over eastern Colorado on Friday, with less of a decrease over western Colorado. With this, we should see a downtick in storm activity over the higher terrains with little to no flood threat. With slow steering winds, burn scar flash flooding is still a concern over the southern high terrains, so please tune into the FTB tomorrow for a more in-depth analysis. Slight increase in moisture for Saturday night both east and west of the Continental Divide associated with the passing trough. This should cause an uptick in storm activity and may provide some light overnight precipitation in the mountains. Then, the drying trend begins through next week. Denver returns to more seasonal PW values with Grand Junction dropping to below average later in the week. Thus, after Saturday, there is little to no threat for flooding. No Apparent Threat as the upper-level trough begins to move eastward and brushes the northern border of Colorado. Storm activity on Friday is expected to decrease as more dry air in entrained into the state. The best chance for afternoon storms will be over the southern high terrains. Flooding is not expected at this time, though recent burn scars may be vulnerable due to slower steering winds. On Saturday, moisture increases some with the passing trough. At this time, not expecting too much instability, but there will likely be an increase in afternoon storms over the northern high terrains with a couple stronger thunderstorms possible. Faster steering winds aloft should help to decrease the flood threat. There is also a potential for rainfall over the eastern plains as the system moves eastward and continues to provide upper-level support for some thunderstorms. Sunday, not expecting much rain, but some residual moisture may trigger a couple isolated storms over the southern high terrains. 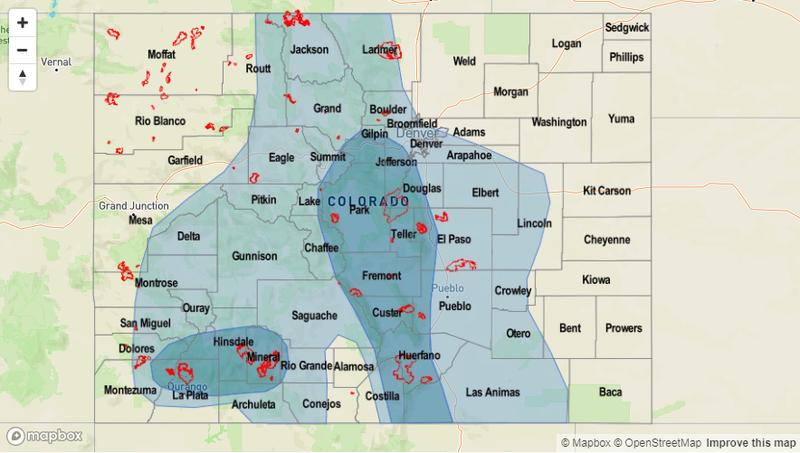 Storms will likely be confined along and near the Continental Divide. Due to the entrainment of drier air, storms that do form this weekend will have the potential for some gusty outflow winds and also produce dangerous lightning. No Apparent Threat as the second trough moves eastward from a nearly stationary position next week. Again, little to no confidence in this forecast, but it looks like the next trough will still move eastward sometime next weekend. This will likely increase moisture over the state and could cause an uptick in storm activity after a week of negligible rainfall. Not much confidence in mid- and low-level moisture either, so there is No Apparent Threat at this time. There is still too little confidence in the forecast to produce a precipitation map. Just like last week, please tune back into Monday’s FTO as models will likely come to more agreement or at least start trending toward a similar solution. Quite an interesting pattern in the water vapor imagery below. Colorado is caught between the flow to the north and south, so weak steering winds aloft are forecast for the first part of this FTO. Currently, an upper-level trough is over the four corners and will continue to influence the weather over the next couple of days with slow movement to the northeast. Extra energy with this upper-level low will help make afternoon showers more widespread and help continue the chances for storms after sundown. Over the next couple of days, upslope flow will continue, which will bring afternoon showers and thunderstorms into the forecast (Event #1). A cold front is expected to move through the area on Tuesday evening, which may help trigger some stronger storms over the eastern plains with increased convergence and should help moisten the low-levels for another round of afternoon storms on Wednesday over the higher terrains. Some snow may even be possible over the highest elevations on Wednesday evening. Also seen in the water vapor imagery is a lot of dry air (yellow, orange and black). This drier air is expected to move into the state starting Friday, which should start to limit the chances for rainfall this weekend into next week. Westerly flow aloft increases starting Monday, so stronger dry air entrainment and downsloping winds should keep measureable rainfall chances low for the start of next week. There are quite a few differences between the GEFS members after mid-next week, so there will only be one FTO event for this forecast. Should be an active start to the week. While flow aloft is quite weak, it remains from the southeast, which will allow upper-level shortwaves to rotate through the state each day. Low-level moisture will also remain high over the eastern plains with southeasterly surface flow. PW values are expected to be well above average through Thursday as seen in the GEFS PW plumes below. Tuesday afternoon, northerly flow near the Front Range is expected produce a line of convergence over the Northeast Plains where it meets the southeasterly surface flow. This will allow some stronger storms to develop over the eastern plains in a high moisture environment. With slow steering winds aloft, heavy rainfall will be possible. A cold front pushes through the state on Tuesday evening and the GEFS shows PW values to increase over eastern Colorado well above the 90th percentile for this time of year. Thus, an Elevated Flood Threat has been issued for the next two days. By Thursday, moisture begins to decrease and flow aloft on Friday turns more northwesterly. Throughout the weekend, the flow becomes more northerly, which starts the entrainment of the dry air seen in the water vapor imagery above. A small disturbance may cause some isolated showers on Sunday as it passes through the state, but with low-level moisture on the decrease, minimal rainfall is expected with the high-based storms. Monday through Wednesday of next week, entrainment of the dry air with westerly flow aloft should bring PW values much closer to average for this time of year. Some high-based, isolated storms are possible over the higher terrains though measurable rainfall should remain nominal. Over western Colorado, moisture steadily decreases over the next week. So outside the slight chance for a Low threat over the 416/Burro burn scars tomorrow, flooding is not expected. Wednesday, some lighter rainfall is possible over the higher terrains though it will become more isolated in nature. Starting Sunday, PW values are forecast to be under 0.5 inches. Models are currently showing the upper jet setting up along the CO/WY border at this time. This may bring back fire danger to the northern portion of the state if the stronger winds mix down to the surface, especially over the Northwest Slope and Northern Mountains. More on this in Thursday’s FTO. Scroll below to read more details about the lone event of this FTO. Elevated/No Apparent Threat as PW values remain near and above the 90th percentile over eastern Colorado the next couple of days. Weak southwesterly flow aloft will keep an active weather pattern over the state, and it will allow multiple shortwaves to rotate through each day. If timed correctly, these shortwaves may help produce more widespread storm action. Southeasterly surface flow over the eastern plains should keep high low-level moisture in place with weak steering winds aloft through Thursday. On Tuesday, a cold front will drop through the state and convergence along the front will allow some stronger storms to develop over the eastern plains. These storms could produce mildly severe weather and heavy rainfall that may cause flooding issues for local streams and low-lying roads. Post-frontal upslope flow on Wednesday will likely create some heavy rainfall pockets over the Front Range and Southeast Mountains. Threats include mud flows, debris slides and local stream flooding with recent burn scars being extra vulnerable. Although moisture starts to decrease on Thursday, another round of afternoon storms over the higher terrains is possible. The most likely area for storms is over the Southeast Mountains, which will again expose recent burn scars to a potential flood threat. 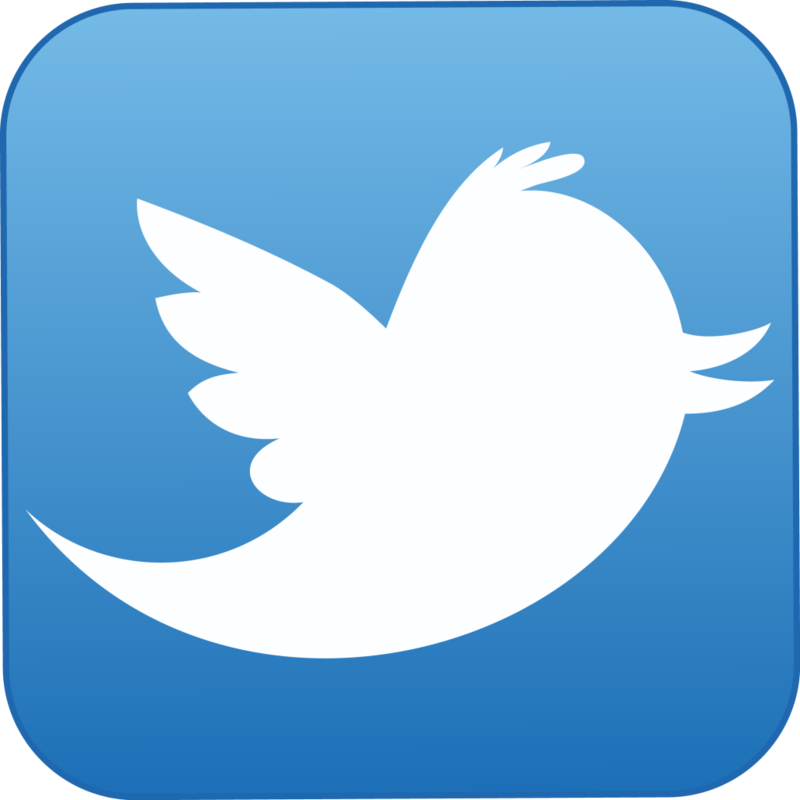 Please check back to the FTB each day this week for a more detailed forecast.